A Jewish sect closely related to, if not a development of, the Sadducees. The origin of this schism is recounted as follows by the Midrash: Antigonus of Soko having taught the maxim, "Be not like the servants who serve their masters for the sake of the wages, but be rather like those who serve without thought of receiving wages," his two pupils, Zadok and Boethus, repeated this maxim to their pupils. In the course of time they were understood to express thereby the belief that there was neither a futureworld nor a resurrection of the dead; and the consequence was that these pupils of Zadok and Boethus renounced the Torah and founded the sects of the Sadducees and the Boethusians. They lived in luxurious splendor; using silver and golden vessels all their lives, not because they were haughty, but because (as they claimed) the Pharisees led a hard life on earth and yet would have nothing in the world to come (Ab. R. N. v., ed. Schechter, p. 26. The text is corrupt. According to one version, Zadok and Boethus were themselves the founders of the sects). Historical in this story is the statement that these two sects denied the immortality of the soul and resurrection. Again, the Midrash is on the whole correct in saying that the sects found their followers chiefly among the wealthy; but the origin of the sects is legendary. 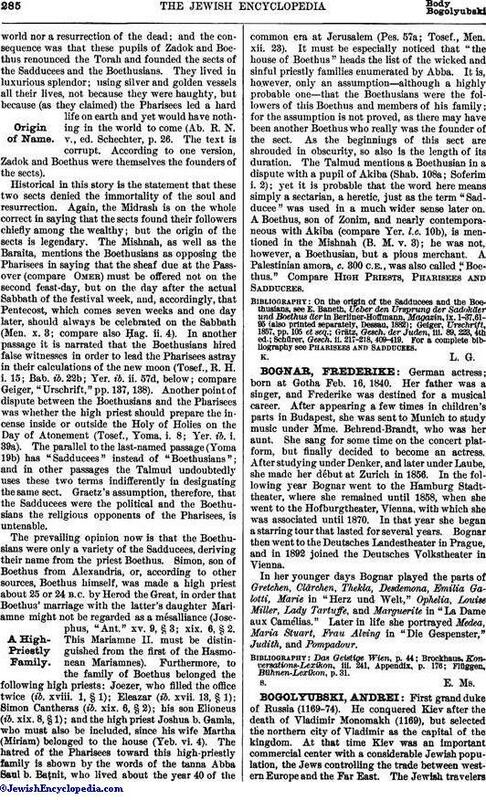 The Mishnah, as well as the Baraita, mentions the Boethusians as opposing the Pharisees in saying that the sheaf due at the Passover (compare Omer) must be offered not on the second feast-day, but on the day after the actual Sabbath of the festival week, and, accordingly, that Pentecost, which comes seven weeks and one day later, should always be celebrated on the Sabbath (Men. x. 3; compare also Ḥag. ii. 4). In another passage it is narrated that the Boethusians hired false witnesses in order to lead the Pharisees astray in their calculations of the new moon (Tosef., R. H. i. 15; Bab. ib. 22b; Yer. ib. ii. 57d, below; compare Geiger, "Urschrift," pp. 137, 138). Another point of dispute between the Boethusians and the Pharisees was whether the high priest should prepare the incense inside or outside the Holy of Holies on the Day of Atonement (Tosef., Yoma, i. 8; Yer. ib. i. 39a). The parallel to the last-named passage (Yoma 19b) has "Sadducees" instead of "Boethusians"; and in other passages the Talmud undoubtedly uses these two terms indifferently in designating the same sect. Graetz's assumption, therefore, that the Sadducees were the political and the Boethusians the religious opponents of the Pharisees, is untenable. The prevailing opinion now is that the Boethusians were only a variety of the Sadducees, deriving their name from the priest Boethus. Simon, son of Boethus from Alexandria, or, according to other sources, Boethus himself, was made a high priest about 25 or 24 B.C. by Herod the Great, in order that Boethus' marriage with the latter's daughter Mariamne might not be regarded as a mésalliance (Josephus, "Ant." xv. 9, § 3; xix. 6, § 2. This Mariamne II. must be distinguished from the first of the Hasmonean Mariamnes). 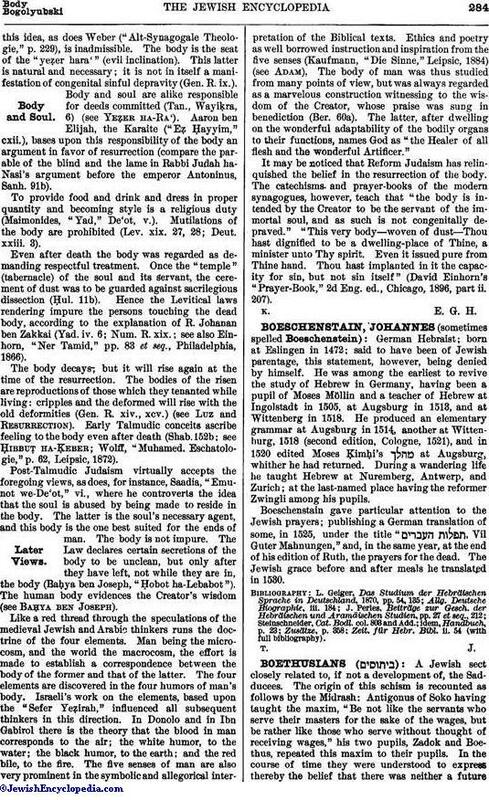 Furthermore, to the family of Boethus belonged the following high priests: Joezer, who filled the office twice (ib. xviii. 1, § 1); Eleazar (ib. xvii. 13, § 1); Simon Cantheras (ib. xix. 6, § 2); his son Elioneus (ib. xix. 8, § 1); and the high priest Joshua b. Gamla, who must also be included, since his wife Martha (Miriam) belonged to the house (Yeb. vi. 4). The hatred of the Pharisees toward this high-priestly family is shown by the words of the tanna Abba Saul b. Baṭnit, who lived about the year 40 of the common era at Jerusalem (Pes. 57a; Tosef., Men. xii. 23). It must be especially noticed that "the house of Boethus" heads the list of the wicked and sinful priestly families enumerated by Abba. It is, however, only an assumption—although a highly probable one—that the Boethusians were the followers of this Boethus and members of his family; for the assumption is not proved, as there may have been another Boethus who really was the founder of the sect. As the beginnings of this sect are shrouded in obscurity, so also is the length of its duration. The Talmud mentions a Boethusian in a dispute with a pupil of Akiba (Shab. 108a; Soferim i. 2); yet it is probable that the word here means simply a sectarian, a heretic, just as the term "Sadducee" was used in a much wider sense later on. A Boethus, son of Zonim, and nearly contemporaneous with Akiba (compare Yer. l.c. 10b), is mentioned in the Mishnah (B. M. v. 3); he was not, however, a Boethusian, but a pious merchant. A Palestinian amora, c. 300 C.E., was also called "Boethus." Compare High Priests, Pharisees and Sadducees. Schürer, Gesch. ii. 217-218, 409-419. For a complete bibliography See Pharisees and Sadducees.